Maggie desperately wanted bread today and there was not a gluten free slice of bread to be found in the house (well there was when she woke up... but then she finished off every last crumb and could not be convinced that we didn't have more hidden away somewhere). So after many hours of listening to complaints about the lack of bread while we waited for Paul to get home from the store in the afternoon, I decided to try my hand at a new bread recipe, using a muffin recipe that I created a few weeks ago as inspiration. Except I was out of coconut oil and rice flour and so I made a few substitutions and the result is one of my favorite baking creations of all time. this size and then it collapsed in on itself. But when I broke off a tiny piece I knew that we'd found an instant winner. I had baked two smaller loafs and the kids devoured them in about ten minutes. Even Mae ate them (I was amazed she tried a bite, since she can be super finicky about how things look). It's a sweet bread with and interesting texture in the center that makes it more like a dessert than any bread I've ever made. The texture is odd especially for a gluten free bread (it isn't soggy, it's almost like a lemon bar/jelly dessert). But after realizing that the project was far more complicated than I expected it to be (because I attempted to make it Mae-proof) I wasn't planning on posting today... until this recipe turned out exactly as it did and I knew I had to share it. It may sound a little odd, with lemon and bacon together in the same recipe, and I was skeptical even as I was making it as to how it would turn out. However I will definitely be making it again! Edited to Add: This bread is definitely best eaten while it's still warm. Once it cools the bacon becomes a little too overwhelming and you can't taste the lemon any more! Preheat the oven to 350 degrees. Mix the dry ingredients. Add the wet ingredients to the dry ingredients. Beat until well blended. Bake at 350 degrees for one hour or until baked all the way through (a knife inserted in the center should come out clean). Allow it too cool (this is when mine collapsed... and I was certain that it was a failure until I tasted it!) 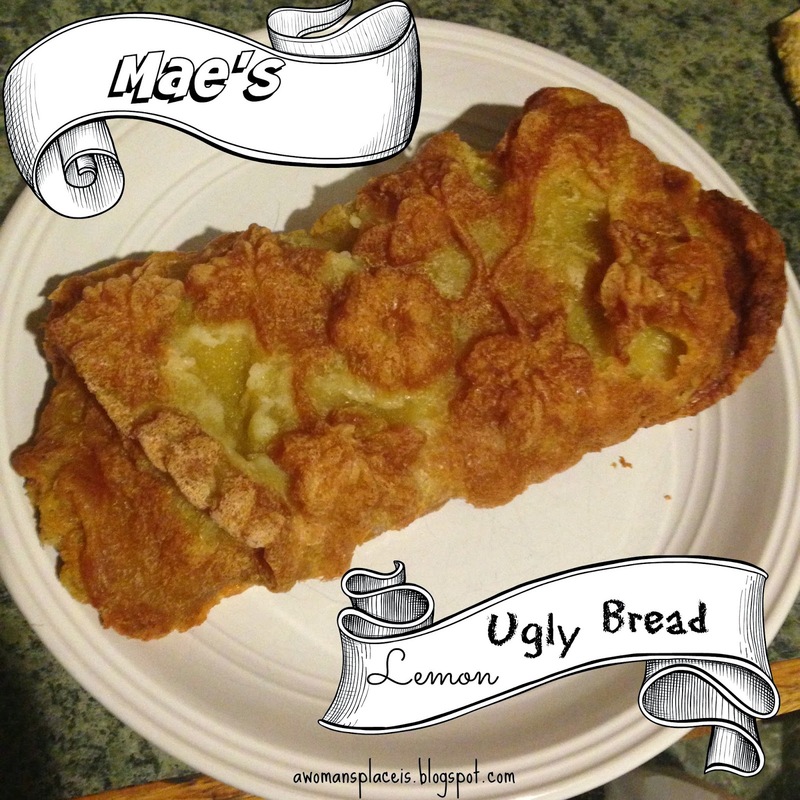 and then enjoy your own loaf of Lemon Ugly Bread!